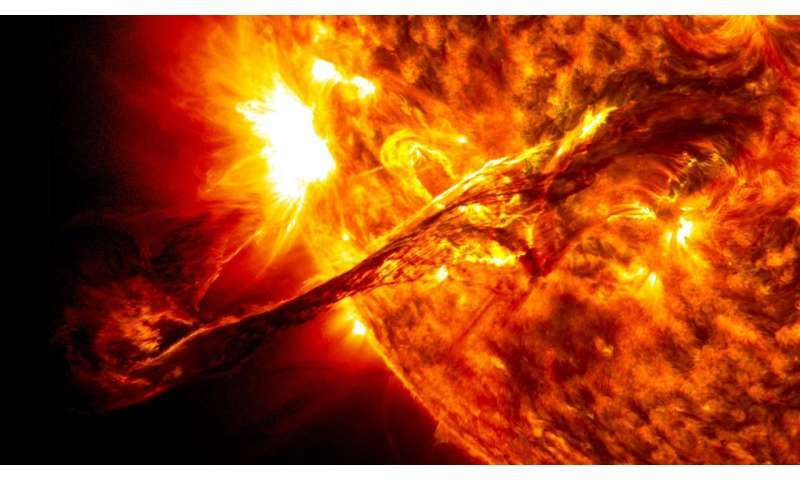 Solar flares, cosmic radiation, and the northern lights are well known phenomena. But exactly how their enormous energy arises is not as well understood. 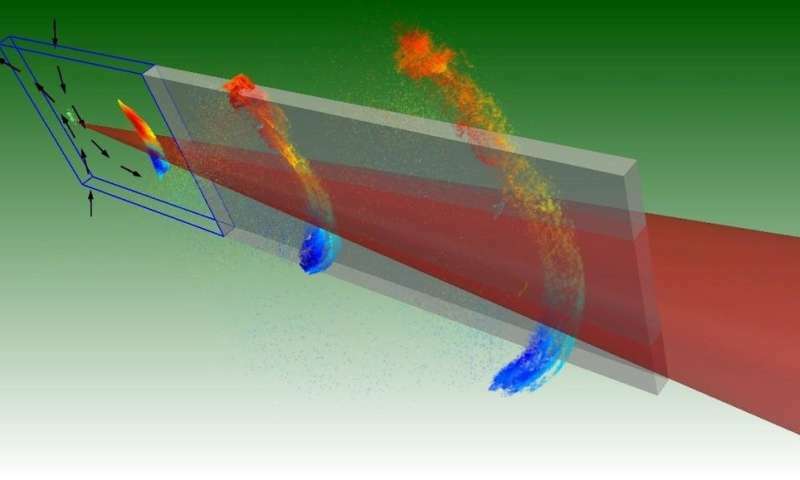 Now, physicists at Chalmers University of Technology, Sweden, have discovered a new way to study these spectacular space plasma phenomena in a laboratory environment. The results have been published in the renowned journal Nature Communications. The research concerns so-called 'magnetic reconnection' – the process which gives rise to these phenomena. Magnetic reconnection causes sudden conversion of energy stored in the magnetic field into heat and kinetic energy. This happens when two plasmas with anti-parallel magnetic fields are pushed together, and the magnetic field lines converge and reconnect. This interaction leads to violently accelerated plasma particles that can sometimes be seen with the naked eye – for example, during the northern lights. The study on which the new results are based was financed by the Knut and Alice Wallenberg foundation, through the framework of the project 'Plasma-based Compact Ion Sources', and the ERC project 'Skena och skina' (Running away and radiating). Studying magnetic reconnection directly in the lab. It's an EU nutter's worst nightmare. This happens when two plasmas with anti-parallel magnetic fields are pushed together, and the magnetic field lines converge and reconnect. Have any sort of argument against magnetic reconnection that isn't an appeal to authority? I'm not sure you are aware that this considered a logical fallacy. @barakn, a couple of things to bolster your arguments. First, MRx at Princeton has been studying magnetic reconnection in the lab for about a decade now. @cantthink69 spouts conspiracy theories when faced with this reality. Second, appeal to authority is not necessarily a fallacy; it's appeal to illegitimate authority that's the fallacy. For example, appeal to the authority of Eclectic Universe nutjobs. 'No, it isn't.' Carl-Gunne Falthammar. Who had a lot more data on it than Alfven ever did. Alfie just backed the wrong horse. He was wrong. Get over it. MRx has become dogma, even Falthammar acknowledges that fact. Falthammar even wrote a paper on the pitfalls of using the moving field lines, apparently the above pseudoscientists didn't get the memo. Nothing has changed in many years, MRx remains pseudoscientific claptrap. The first kind of problem is that the construct of moving field lines is sometimes used to produce the incorrect magnetic field evolution in cases where equation (2) is not satisfied. In fact, the most interesting plasma physics occurs pre­cisely where and because this equation is not satisfied, such as the auroral acceleration region, ***magnetic field reconnection***, turbu­lence, shocks, and many wave modes. My emphasis for the hard of reading. Lol. One ageing Alfven adherent writes a paper that has never been cited, and that is a reason for the thousands of plasma physicists to just down tools and disregard all the evidence in favour of it from in-situ and lab experiment? Sorry, not happening. Alfven was just plain wrong. One ageing Alfven adherent writes a paper that has never been cited, and that is a reason for the thousands of plasma physicists to just down tools and disregard all the evidence in favour of it from in-situ and lab experiment? Nope, they just need to refrain from pseudoscience and the wrong models. Circuit theory must be used to describe the phenomena as that is how plasma operates, not the magic of moving and reconnecting field lines. Amusingly jonesdumb has no issues with these types of lab experiments despite the fact there are neither lasers nor microfilm objects in space plasmas. What would you know? Plasma really isn't your strong point, is it? All you do is parrot decades old stuff from Alfven, that even his closest colleague no longer believes. And hasn't done for a long while, even while Alfven was alive. And Akasofu knows that reconnection happens, he is just looking at whether it is an inside-out or outside-in phenomenon. The fact that reconnection happens is not under question. I know of no plasma physicist still publishing who denies the reality of MRx. Only a bunch of unqualified mythologists. It's a hell of a lot closer to the observed, in-situ reality (Themis, Cluster, MMS), than the drivel you peddle. And a lot closer to reality than putting a squillion volts through a metal sphere to model the Sun! Akasofu knows that reconnection happens, he is just looking at whether it is an inside-out or outside-in phenomenon. The fact that reconnection happens is not under question. Where did I say it doesn't happen? The fact that the plasma ignoramuses use pseudoscientific claptrap to describe it doesn't mean explosive events don't occur. Where did I say it doesn't happen? What? Every f***ing story that mentions magnetic reconnection, you are on here posting that Alfven says it's pseudoscience! So, now you're saying it does happen? Great. Nothing else to discuss is there? Alfven is not a "nutjob" nor an "illegitimate authority." I could appeal to Einstein on the cosmological constant as paraphrased by Gamow - "biggest blunder of his life" - and yet the cosmological constant and time-dependent variations of it have been revived in explanations of Dark Energy. Einstein is not a "nutjob" nor an "illegitimate authority" and yet he appears to have been wrong - it really wasn't his biggest blunder. Any appeal to authority, even if that authority happens to be right, is inherently a weak argument. Every f***ing story that mentions magnetic reconnection, you are on here posting that Alfven says it's pseudoscience! So, now you're saying it does happen? Nobody ever discounted the explosive events moron. Saying that the plasma ignoramuses are using pseudoscientific claptrap to explain this process is not saying it doesn't exist. Because MRx has become dogma the erroneous label will likely stick, even Falthammar acknowledges this, but it is an anti-science attempt to ignore that which Alfvén described long ago. Because MRx has become dogma the erroneous label will likely stick, even Falthammar acknowledges this, but it is an anti-science attempt to ignore that which Alfvén described long ago. No, it isn't, and Falthammar has never said any such thing. Quit the lying. Any appeal to authority, even if that authority happens to be right, is inherently a weak argument. So to is the appeal to the authority of "thousands of plasma physicists". Science is neither democratic nor a popularity contest. And a lot closer to reality than putting a squillion volts through a metal sphere to model the Sun! You have never addressed Birkeland and his terella experiments and how he used it to discover a process to explain auroras. He explained the auroras are created by cathode rays and flying electric ions, which has since been confirmed. Those very same processes he explains that create these phenomena require electric discharge. It is the only way to explain his theory, these processes cannot be recreated any other way, unless of course you want to point to magic like you typically do. Why would I need to? It was a hundred frigging years ago! We know, due to technology that Birkeland could only dream of, that the Sun isn't a metal ball powered by electricity! There is no current. There isn't even a valid bloody hypothesis. There isn't even a valid bloody hypothesis. You are suggesting Birkeland didn't offer a mechanism to explain the auroras which was later confirmed and a plasma phenomena called a Birkeland current (named after him) doesn't exist? LOL! Another day, another new display of acolytic moronism. I was talking about your idiotic electric sun nonsense. So since there "isn't even a valid bloody hypothesis" (hand wavy claim) it can't be electric? So before Zwicky invented DM it didn't exist? Sounds like a moronic statement. If you want to find something you have to look for it, with the resolution to be usable. Look for it as rigorously as you're looking for DM and you'll find the electric currents first. No we won't. They'd be bleeding obvious to any number of spacecraft over the past few decades. They ain't there, and there is no valid hypothesis for how they could create a star. It is pure woo, dreamed up by people who haven't got a clue. What would be "bleeding obvious"? You don't even understand what your looking for nor have the resolution to detect it. Errr, a current? That would be electrons, yes? Heading in towards the Sun? Guess what we have spacecraft monitoring 24/7? There is nothing there. I've heard the idiot Scott's feeble excuse that they are only drifting in. Pathetic. The velocity of the electrons is irrelevant. It is the relative velocity between the spacecraft and the electrons that counts. So, a motionless electron will hit a detector at say 10 km/s if that is the spacecraft velocity. Is that detectable? Too bloody right it is. Go do some maths. Let's say 1 m/s for the non-existent electrons. What energy does that impart, after it's fought its way past the outgoing solar wind and IMF? What is the energy output of the Sun per sec? How many electrons do you need? Any chance of getting a radio signal through that little lot? Sorry, it's nonsense. Purely for the wooists. I've heard the idiot Scott's feeble excuse that they are only drifting in. A drift current is not a "feeble excuse". Like I said, you don't even know what to look for. And electrons don't have "to fight its way past the solar wind and IMF", the Sun's electric field drives these currents. You clearly know nothing about electric discharge in plasmas, that's why it's "impossible woo" to you, your willful ignorance.